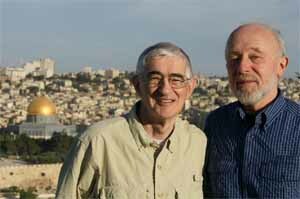 Two pre-eminent theologians, Marcus Borg and John Dominic Crossan, will be in Denver for a series of lectures this November. The theme for the series, which runs Friday, November 1 through Sunday, November 3, is “Jesus and Paul, Then and Now: The ‘Kingdom of God’ and the ‘Lordship of Christ’ in the First and Twenty-first Centuries.” The cost is $15 per lecture or $60 for the entire series. Keep in mind that both Borg and Crossan will also be offering a dialogue sermon at Messiah Lutheran Church for their Sunday 9:30am worship, followed by a Q-and-A session at 11am. For more information and to get tickets, visit http://www.messiahdenver.org/learning/BockFoundation.cfm. You can also call Messiah Lutheran Church directly at (303) 355-4471 or send them an e-mail at info@messiahdenver.org.